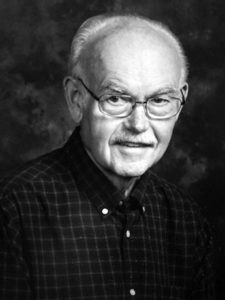 Dale “Tiny” Sorgenfrei, 80, of Rogers City, passed away December 18, 2017 at home. He was born June 23, 1937 in Moltke Township to Erhardt and Arlene (Campbell) Sorgenfrei. Dale was a sailor on the Great Lakes for 42 years, retiring in 1999 as a wheelsman. He played spitzer for many years in the Rogers City Spitzer League. Following retirement, Dale served as a trustee and was a member of church council at Peace Lutheran Church. He also was a volunteer at the Great Lakes Lore Museum and a member of the German Club. He is survived by his wife, Joan; son, Scott (Hannah) Sorgenfrei; brother, Neil (Juanita) Sorgenfrei; sister, Joyce Hoeft; in-laws, Marie Roluffs, John and Gloria Schlak, and Florian and Grace Idalski; aunt, Opal Adkins; and many nieces and nephews. Dale was preceded in death by his parents; a son, David Sorgenfrei; father-in-law, Riewert Roluffs; and a brother-in-law, Roger Hoeft. Friends visited at the Beck Funeral Home Wednesday, December 20 from 3 until 8 p.m. with a prayer service at 7:30 p.m. Visitation will resume today (Thursday) at Peace Lutheran Church from 10 a.m. until time of service at 11 a.m. with the Rev. J. Derek Riddle officiating. Inurnment will take place at Peace Lutheran Cemetery. Memorials may be given to Peace Lutheran Church, Michigan Parkinson Foundation or Hospice of Michigan in memory of Dale Sorgenfrei.